Cocktail Pueblo | COCKTAIL DE COCKTAIL ! Pour vos soirées mondaines, vos galas, vos barbecues, vos séminaires d’entreprise, ne cherchez plus et mettez donc cette galette dans votre platine laser. 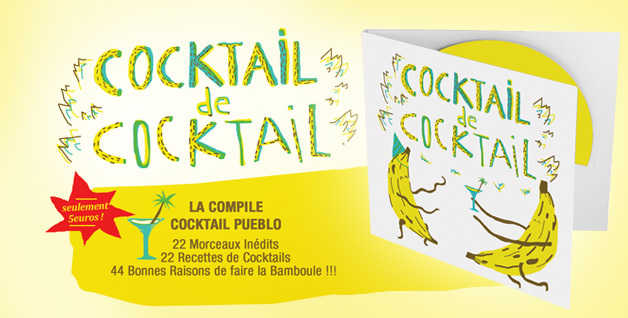 La compile de de Cocktail de Cocktail Pueblo c’est : 22 artistes ou bands tourangeaux et d’ailleurs mais bien de chez nous qui vous ont concocté 22 recettes de cocktails en chanson ! 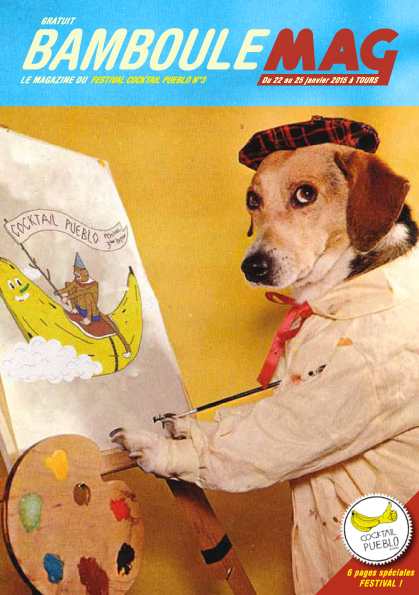 Avec son petit livre de recette, une belle pochette sérigraphiée d’un chien en banane qui boit des martinis, et un Cd gravé. For your garden parties, barbecues, professional meetings, with your family or between friends, get this comp ! Cocktail Pueblo inc made the perfect solution for all your expectations « COCKTAIL DE COCKTAIL » (that we could translate by cocktail of cocktail). You ‘re gonna ask : »what you could find inside? ». You will not believe us. Inside, you ll find a record ! Yes, with 22 songs of 22 bands from our beautiful city of Tours (yes, you know « les chateaux of the Loire Valley », we have wine and cheese, but also, good bands). An amazing booklet with your favorite recipes of cocktails., and a dog dressed up like a banana on the screen printed cover. Enjoy, it’s just 5 euros (and maybe a little bit more if you buy it from outside of France). And don’t worry, you’ll know how to say « bamboule » in english as soon as you’ll play this comp. Loves and cocktails.